This 3 bedroom unit is FANTASTIC! Beautiful views and a living area and deck that are unbeatable. The harbor view of boats passing by, even late at night, gives a feeling of serenity and relaxation. It is the perfect place for a family or group of friends to gather. Everything about the home is perfect. The setting, views, decorating, and attention to detail is over the top. Cooking meals for a big group was even fun with the beautiful kitchen to work in and the wonderful appliances to work with. We definately want to come back again. Pam has been great at handling all the details and accomodating all questions right away. We hope to be able to take the sailing trip next time we are here. This has been a GREAT experience as we celebrated our daughter's college graduation with family and friends. CASA DE BALBOA IS ABSOLUTELY WONDERFUL! We stayed at Casa De Balboa the week after Thanksgiving 2012. We stayed in the upsiatrs unit #225 and have a two year old son. The unit was absolutely perfect for us. The master bedroom has a balcony and looks over the Bay. The two back bedrooms were very quiet and perfect for our child to sleep. Pam provided both a porta crib and inflatable toddler mattress. The toddler mattress was absolutely great. It was also lovely that the unit was on one level so we didn't have to worry about stairs with our little one. The kitchen was quite nice and well stocked so that we could cook there often, as it was easier than eating all meals out with our child. In terms of the unit, it was spacious, comfortable, with first class accommodations. The beds are super comfortable. The furnishings lovely. Pam provides everything you need and some nice little extras, like bathrobes. The unit is really tastefully decorated but not overly decorated so that we could easily move small breakable items to one counter out of the reach of our son. Sitting on the balcony at night with a glass of wine or during the day with coffee and watching the birds, boats, beach, fisherman....welll it was great. It is also very quiet on the Bay side, and after our visit, we realized this was the side to be on. Given that it was the holidays, Pam's son called to ask if we would object to holiday decorations in the unit. I thought it was thoughtful that they gave us an option. When we said it would be nice, we came home one day to a wreath, white lights all along the balcony, a very tasteful artificial tree with lights in the living room and a couple of other very nice Christmas decorations. The theme is that the unit and Pam and her son are thoughtful and provide everything you need and you will really relax here, even with a toddler! Whole-heartedly recommend Casa de Balboa and hope to stay there again! BobTeSeattle Seattle Reviewed February 7, 2018 Exceeded Expectations Just finishing up a two week stay in Casa 227. We could not have been more pleased with our stay. We have stayed at rental properties before and so often, they don't exactly match up with the pictures you see on the web site. In this case, this place far exceeded our expectations. The location is ideal and the view from the unit is breathtaking. My wife and I love to walk and the Balboa Peninsula is a walkers paradise. We parked our car in the provided garage and hardly drove our car at all...almost everything is within walking distance. The unit itself is beautifully decorated and meticulously maintained. Everything is provided from the gas heater on the patio, cable TV in the living room and bedroom, and a clean barbeque for those nights that you'd rather eat in rather than visit the many outstanding restaurants that are nearby. One more point...its seems a lot of folks would prefer an ocean front unit rather than one on the bayside. In my opinion, Casa de Balboa is the better option in that it is quiet, and located in an area that certainly has a better view and many options (a bayside beach literally 20 feet away from your patio) but it is not located on the crazy noisy promenade that runs in front of the ocean front houses. Plus, the beach is wide and in many places, you cannot even see or hear the ocean from your patio. Moreover, those patios have no privacy and there is a constant flow of all kinds of people walking by at all hours. We walked the promenade everyday and we were always happy to return to the quiet, serene, bay side. OK...end of review...my wife just reminded me that if I continue to gush, this place may not be available for our next visit. We will definitely be back! Awesome Vacation Home At the Beach! We stay at Newport Beach one or two weeks a year and frequently rent direct from owners. Casa de Balboa is far above all other rentals we have ever stayed at. The amenities are 5-star, luxury bed linens, awesome pillowtop matresses, top of the line kitchen appliances and cookware (didn't use them much, we were on vacation, you know). The veranda was awesome, we spent each morning having breakfast on the balcony and ended the day watching reflections of the sun setting and the city lights coming on. The owners were very responsive to any questions, and all emails were answered within an hour. 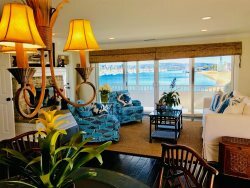 We will definitely stay at this location again...book soon, because the secret is out--Casa de Balboa is probably the most excellent vacation home you will find on the peninsula! Enjoy! Location was tremendous, away from the bustle of the oceanside of the penisula yet very accessible. The property itself was every bit as advertised. Wonderful condition and quality. Support from the Casa staff was also exceptional ... Greg in particular was very helpful. We are fortunate enough to travel a great deal and often choose to rent homes instead of hotel rooms. We can honestly say that Casa de Balboa is an excellent choice for anyone who wants to: be close to the beach, swim or fish on the bay, enjoy the lovely ships as they pass, watch your children on the sand as you enjoy morning coffee on the terrace, bbq to your heart's delight, bike-ride the peninsula, take the ferry to the island, walk to great restaurants, soak up the rays, or otherwise enjoy the good life that brings people to sunny southern California. The word is out: Casa de Balboa is without equal in quality and location! FIRST CLASS! There can't possibly be a finer place to stay. Truly spectacular. FIRST CLASS! Location beyond compare! Unbelievably comfortable beds, fine linens, including a surplus of jumbo luxury beach towels- no need to pack your own. Beach chairs, umbrellas, (even saw stroller, kids beach toys, etc in garage! Washer and dryer in unit and a spare dryer in the garage!) Perfect location. Steps from Newport Pier, Crab Cooker and so many activities (Newport Fun Sports less than a block away - the absolute best bikes, electric boats, paddle boards, electric loungers) and too many great dining experiences - Walk to The DOCK Restaurant by the Cannery. Already missing the bay outside our door and watching the boats passing by all day - was a beautiful site! Watched the sun rise literally out our bedroom, living room and patios every morning! Kitchen appliances and tools were incredible - Pam - you didnt forget a thing! viking stove and oven, krups coffee maker, bosch dishwasher, jumbo GE monogram fridge, cuisinart toaster, blenders - beautiful bone china - and tons of it! Best of both worlds - bay and ocean - without the ruckus of being on the boardwalk. The peace and quiet of the bay was tranquil and the party life of the boardwalk and the pier shops and restaurants was just around the corner - a short 2 minute walk away. Truly, truly the best spot in all of Newport. I was raised in Newport and we rented two other houses earlier this summer in addition to this one - and this was by far superior. There will be no reason to ever rent elsewhere again. Thank you again Pam for making the stay so special - a memory for a life time for our family. BEST NEWPORT BEACH VACATION SPOT! Treated our mom to a weekend getaway at Casa de Balboa and she loved it! The views and accommodations were amazing, we will definitely be visiting again! The location provided a relaxing atmosphere and made our stay very enjoyable. Comfort and style rolled into one, we would definitely recommend Casa de Balboa to anyone looking for a wonderful beachfront getaway! Casa Balboa is the best spot in town, waking up to see the changing colors of the Newport Harbor, jumping on a bike and taking a cruise toward the Wedge, or over the bridge to Huntington Beach, the shops, the restaurants, location is tops. The home has now become my "second home" it has all the comforts that one needs, wifi, well appointed kitchen, televisions in each of the bedrooms, comfortable, roomy, charming, and conveniently located. There is nothing more than one needs for their Newport Beach Vacation. I'll be sure to return! LOVED IT! Stayed in Casa 225 and thoroughly enjoyed our stay (six of us and a toddler). It is spacious, immaculate, and has a great view of bay full of yachts. Sat on the deck for cocktails in the evening. The decor is classy beach style. If you like to cook, this kitchen has everything you need. Wonderful sheets and towels. Everything you need to go to the beach including sand chairs, umbrella, and towels. The peninsula is very busy with tourists, but this condo is in an area away from all the crowd--very quiet-peaceful location. Would definitely stay again.